Lake Tahoe is a destination for many business retreats and group gatherings. The opportunities for outdoor adventure and self-restoration are endless. Help your group collaborate, connect and reflect through yoga. Our corporate and large group packages are designed to suit your groups' needs. ​We'll cater to your requests, offer the practice at your choice of location and add in some special touches unique to Lake Tahoe Yoga. We'll come to you. Being a local studio, we have connections with many of the area hotels and resorts. We've taught on the beach, lawn and in conference centers. We'll come prepared with music and a microphone. You and your group will depart feeling peaceful and relaxed. Practice in our studio. The space has everything needed for participants at all levels. Space must be booked at least 1 month in advance. -hotel, rental house, condo. You name it, we'll be there. Choose a location and we'll bring the practice to your group. From boathouses to paddle boards and boats, practice Yoga everywhere. Want to add in a hike and stretch at the top? We'll be there, too. Looking for us to plan the day for you? No problem. We know the best places to hike, bike and swim. Just ask. Advanced booking of 2 months required for large groups and full-day sessions. If your group is larger than 30, we suggest two separate sessions for the best experience. 60 minute, 90 minute and 120 minute single sessions, daily or series may be booked up to 1 month in advance. -60 min., 90 min. or 120 min. Set up on one of Lake Tahoe's incredible beaches and feel the stress of the office slipping away. Beach sessions are fun, safe and challenging. Shift your perspective while balancing in the sand and let your eyes wander to the deep blue waters of the lake. Advanced booking of 2 weeks required. Weekend sessions book up quickly. Morning or evening sessions are recommended. If booking for groups larger than 30, we suggest two separate sessions for the best experience. Participants should come prepared with: beach blanket or towel, sunscreen, water, hat and sunglasses. Swimming after class is always encouraged. -90 min. or 120 min. Have you ever wished you could walk on water? Lake Tahoe's water is so clear and calm that you may feel like you are. 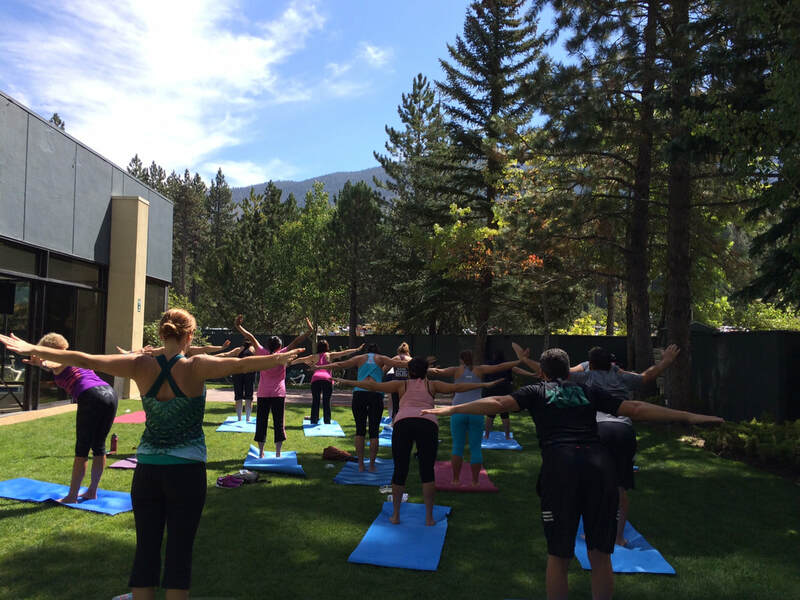 Lake Tahoe Yoga was the first studio in Lake Tahoe to offer stand up paddle yoga sessions. We welcome everyone to try our paddle yoga practice. These classes will teach balance, body awareness and encourage a sense of tranquility within while you float on the waters of the lake. Advanced booking of 2-3 weeks required. Sessions in July and August book up quickly. Morning sessions are recommended due to high winds in the afternoons. Come prepared with clothing that can get wet, sunglasses (make sure they are attached to you), hat and sunscreen. Lockers are available for valuables. *50% deposit is due upon confirmation of booking.